Archaeologists working on the site of a former car park in the English town of Lincoln were surprised to have uncovered a medieval stone coffin. The discovery was made near the Theatre Royal in the centre of Lincoln, which was one of the wealthiest towns in England during the Middle Ages. The team from Network Archaeology, supported by local property developers Jackson and Jackson Developments, have been working there for the last three weeks. Beneath the tarmac of the car park, there were thick layers of rubble and soil, built up over hundreds of years in this busy location in the heart of the City. While carefully removing these layers in sequence, the archaeological team found the foundations of a fifteenth-century stone building next to a cobbled surface. 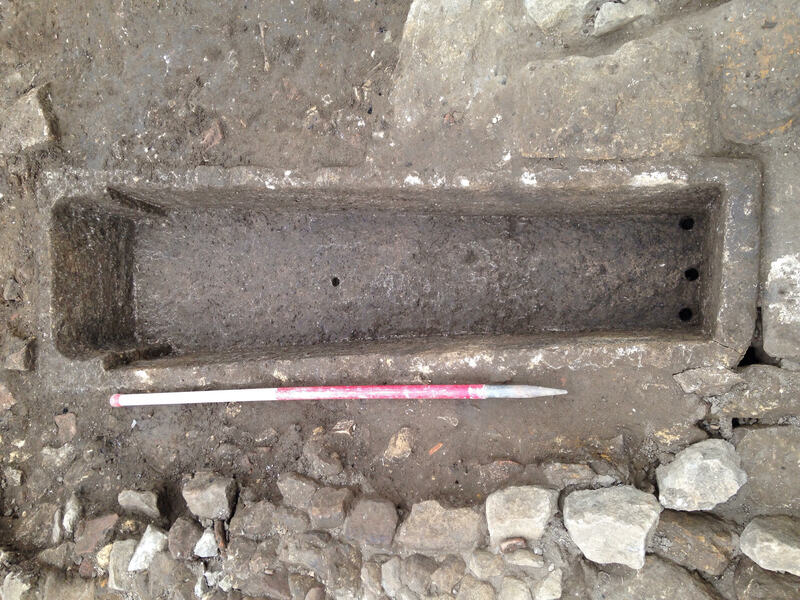 Dan Heale, archaeological supervisor, explained that the stone coffin had been set in the ground next to the building with stones laid neatly around its edge and level with the cobbles. Stone coffins were used in medieval times, but the style of this one was unusual. Their first thought was to wonder if this could be a well-preserved Roman coffin? Or was it closer in date to the fifteenth-century building? But the medieval specialists left them in no doubt: the tapered shape, and the full-depth, but widened, head-hole (to support a pillow or a headdress) is typical of the period from around AD 1150 to 1250. Whatever its origin, by the fifteenth century it had been moved and re-used for some other purpose, perhaps as a water-trough for horses, cleaning woollen fleeces or tanning leather. The original purpose of the central hole would have been to allow liquids from the decomposing body to flow out of the coffin into the ground so as to avoid sanitary and health problems. But the three holes at the foot end were probably drilled later, to speed up drainage when it was used for its new purpose. There have also been many medieval and post-medieval finds including pottery and metalwork, which will help fill in the details of the story of the site. Excavations on the site are set to finish soon, with work stopping short of digging into the Roman layers. Working closely with the City Archaeologist for Lincoln, the developers will not disturb the Roman remains, which will be left in place for future generations. For safety and security, the site is fenced off, but the Network Archaeology team, along with a number of enthusiastic volunteers, have been working in full view at this city centre site behind busy Clasketgate and the Theatre Royal. The archaeologists are inviting the public to come and see the team at work at Grantham Street or view some of the finds on display at the Historic Guildhall (above the Stonebow) on their Heritage Open Days – September 13th-15th. For more details please check out the Network Archaeology Live Facebook page.